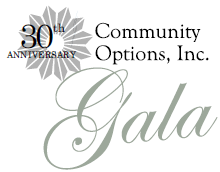 30th Anniversary Gala | Community Options, Inc.
On May 9, 2019, Community Options will celebrate its 30th anniversary. We will hear from noted leaders, advocates and supporters who make our work possible. The board and families of Community Options want to share the joy experienced by a person with a disability who develops a greater sense of freedom by living and working in the community. Community Options invites you to join our Trustees and volunteers in celebrating 30 years of service. Please consider becoming a sponsor. Together we can help to continue the legacy of supporting society’s most vulnerable citizens. Click here to download the sponsorship guide.